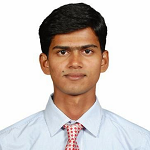 We are in 21st century where digital world is growing tremendously. Now a days everything is trying to be online and all business and products are trying to be in visual representation. Remember earlier days when we used to travel several miles to take some coaching class? What about now? And the tutors also had to arrange a large classroom with all the facilities. I am not saying these have been stopped but definitely you will agree to me that these have been reduced a lot. Today we are in digital world where for every small things first we Google it. Whenever we need any reference to any particular topic, we first check in Google, YouTube or any other video site for reference. Depending upon the requirement, we subscribe for the course, make payment online and take the course and we are done! The same applies to those also who want to teach. What they do? Record their session, put it as a course on Udemy or any such video subscription site and sell. All done! No need of classroom and other amenities. This is the beauty of digital stuffs. Today I am going to show you a tool using which you can also create your own video demand websites, online training and many more. Uscreen is a video creating site with several features. This tool is perfect to create online training, courses or any such training. This tool is a best fit for you if you are an online tutor or instructor. Even if you are teaching offline, you can make video, presentation and can teach. You can also create membership site and can earn money. Create your site and start using subscription based model where you charge people for subscribing. Do you want to target your audience through some kind of webinar or webcasting? Here is the ultimate solution using which you can reach to your audience. Also, you can monetize your webinars and can earn some indirect money from it. Here indirect money means you can get some extra income as the main motive of webinars are some kind of subscriptions or selling products which are your direct source of income. Organizations usually provides high standard training to their employee. Many time offline training are being done but that becomes hectic to travel every location and provide training offline for the training department. So here is the best solution for that. What best they can do is, design the presentation, seminars or videos and can sent it across all locations or can arrange some kind of webinars. Now a days many companies are inheriting this culture and are beneficial for both employee and employer. You can monetize your videos easily by selling them individually, as rentals, or as a subscription service easily. There are many features of it. Some of those are like below. Uscreen provides some unique features to their customers and you will be much satisfied with kind of service they provide. Here are few main features of Uscreen. Upload videos, audio, podcasts, PDFs, Excel sheets, documents and any other type of content, and securely deliver them to your end users. This gives you more flexibility to create what you desire to do. This is the most important feature that I like about Uscreen. For a marketer like me, we have different requirements for each campaign and so 100% customization really needed each time. And it’s great to know Uscreen fulfills. Schedule your content to appear in user's library automatically and also be removed automatically. This feature is commonly used with subscriptions or training. No matter which country you support, they provide full flexibility for it. Currently I am thinking to start a new campaign for Norway and so I will not have to think much as they provide multi language support and can be used very easily. They have quite large number of sample themes which you can use for your campaigns and can design the best out of it. As these are fully customizable and so you can do whatever changes you would like to do in these. This list simply continues and you can check more of their features here. The pricing of Uscreen starts at just $99 per month where you can make unlimited videos with 1000 users allowed. Also, as stated earlier all the plans has unlimited bandwidth. 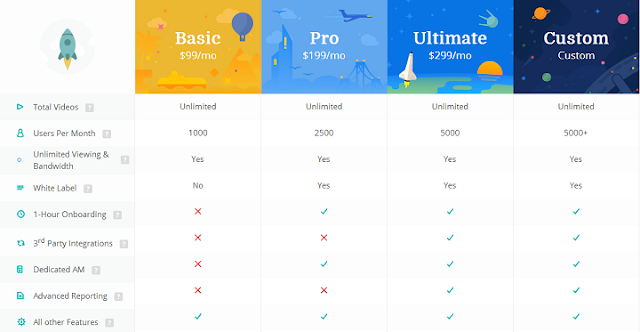 The $99 plan is the basic plans for the starter and small scale business. The pro plan is at $199 and the ultimate at $299. You can ask them to quote you custom offers. 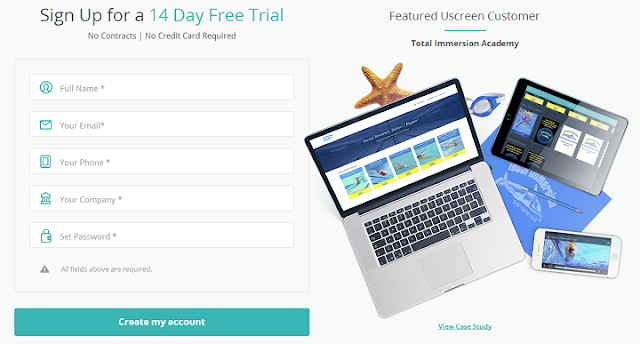 Apart from this, Uscreen provides 14 days of free trial without any credit card. You can enjoy free trail and if you like, proceed with it. This was all about Uscreen video subscription program. I really liked this service and you will also like it. If you are an online marketer or instructor or anyone who have an online presence and want to provide some services than you must try them once. Have you tried Uscreen? Do share your views with us. Or do you know any such apps like Uscreen? Do share with us.